For the simplest method that requires the cheapest material, simply fill your affected pot or pan with a layer of water, add a 1/4 cup of baking soda and heat until boiling. Simmer for 15 minutes, let sit for 30 minutes, and then scrub the cookware as usual. For more stubborn burned-on foods, you can use a combination of baking soda and vinegar. You can also try using Alka-Seltzer tablets, and dryer sheets are especially useful for larger cookware such as casserole dishes. 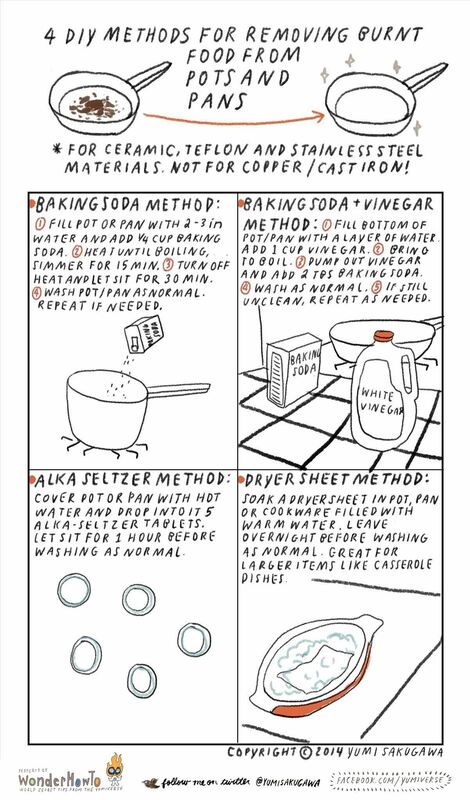 Take note that these methods do not apply to copper or cast iron cooking equipment. For more info on cast iron and non-stick items, along with other tips for removing scorched spots (like using sugar cubes), check out Karen's detailed guide over at Food Hacks!